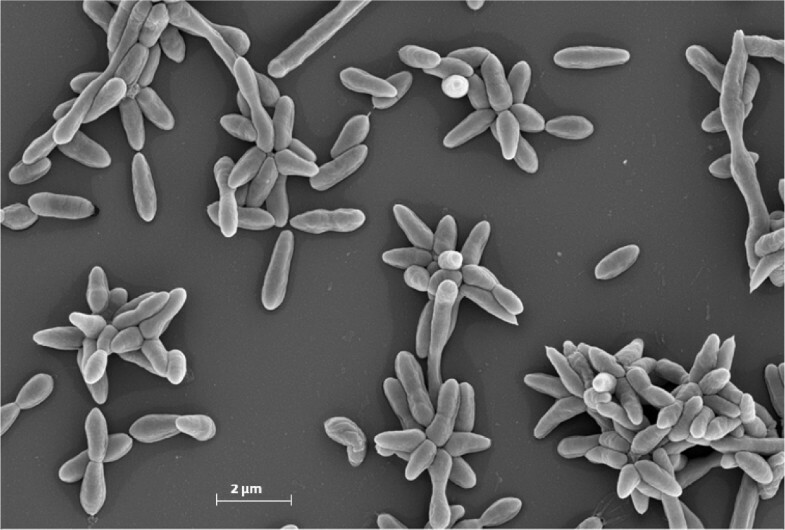 Phaeobacter gallaeciensis CIP 105210T (= DSM 26640T = BS107T) is the type strain of the species Phaeobacter gallaeciensis. The genus Phaeobacter belongs to the marine Roseobacter group (Rhodobacteraceae, Alphaproteobacteria). Phaeobacter species are effective colonizers of marine surfaces, including frequent associations with eukaryotes. Strain BS107T was isolated from a rearing of the scallop Pecten maximus. Here we describe the features of this organism, together with the complete genome sequence, comprising eight circular replicons with a total of 4,448 genes. In addition to a high number of extrachromosomal replicons, the genome contains six genomic island and three putative prophage regions, as well as a hybrid between a plasmid and a circular phage. Phylogenomic analyses confirm previous results, which indicated that the originally reported P. gallaeciensis type-strain deposit DSM 17395 belongs to P. inhibens and that CIP 105210T (= DSM 26640T) is the sole genome-sequenced representative of P. gallaeciensis. Strain CIP 105210T (= BS107T = DSM 26640T) is the type strain of Phaeobacter gallaeciensis, the type species of Phaeobacter, a genus of marine species of Rhodobacteraceae (Rhodobacterales, Alphaproteobacteria). BS107T was isolated from the scallop Pecten maximus and was initially described as the type strain of Roseobacter gallaeciensis . After comprehensive reclassifications of Rhodobacteraceae genera, BS107T became the type strain of the species P. gallaeciensis , currently comprising the species P. gallaeciensis, P. inhibens, P. caeruleus, P. daeponensis, P. leonis and P. arcticus. A recent study  revealed the non-identity of the reported identical deposits DSM 17395 and CIP 105210T and confirmed that the strain CIP 105210T represents the original P. gallaeciensis isolate BS107T, which is now deposited in the DSMZ open collection as DSM 26640T. In contrast, strain DSM 17395 was reclassified as a representative of the sister species P. inhibens. Analysis of their similar, but distinct metabolic capacities allowed for a discrimination between the two strains, which were originally reported to represent the same type strain . Thus, in the absence of sequenced genomes, the assignment to species was essentially based on deviating plasmid profiles and molecular analyses (16S rDNA, ITS, DNA-DNA hybridization), which showed convergent results. The genus Phaeobacer comprises effective surface colonizers. Comparative analyses of strains DSM 17395 and DSM 24588 (= 2.10) revealed a high level of adaptation to life on surfaces . The production of the characteristic antibiotic tropodithietic acid (TDA) correlates with the formation of a brown pigment that is eponymous for Phaeobacter . Current scientific interest in Phaeobacter is based on the role of its strains as probiotic agents in fish aquaculture  and as agents of bleaching diseases in marine red algae , as well as on their potential regulatory activity during phytoplankton blooms  via so-called roseobacticides . Here we present the complete genome sequence of P. gallaeciensis CIP 105210T, together with a summary classification and a set of features, including insights into genome architecture, genomic islands and phages. Figure 1 shows the phylogenetic neighborhood of P. gallaeciensis CIP 105210T in a 16S rDNA gene sequence based tree. The sequences of the four 16S rRNA identical gene copies in the genome differ by five nucleotides from the previously published 16S rDNA gene sequence (Y13244 ). Phylogenetic tree highlighting the position of P. gallaeciensis relative to the type strains of the other species within the genus Phaeobacter and the neighboring genus Leisingera. The tree was inferred from 1,381 aligned characters of the 16S rRNA gene sequence under the maximum likelihood (ML) criterion as previously described . Ruegeria spp. were included in the dataset for use as outgroup taxa. The branches are scaled in terms of the expected number of substitutions per site. Numbers adjacent to the branches are support values from 1,000 ML bootstrap replicates (left) and from 1,000 maximum-parsimony bootstrap replicates (right) if larger than 60% . Lineages with type strain genome sequencing projects registered in GOLD  are labeled with one asterisk, those also listed as ‘Complete and Published’ with two asterisks. Genome sequences are available for P. arcticus (DQ514304) , P. inhibens (AY177712) , P. caeruleus (AM943630) , P. daeponensis (DQ981416) , P. gallaeciensis (IMG2545691711, this publication), L. aquimarina (AM900415) , L. methylohalidivorans (AY005463)  and R. pomeroyi (AF098491) . A representative genomic 16S rDNA gene sequence of P. gallaeciensis CIP 105210T was compared with the Greengenes database for determining the weighted relative frequencies of taxa and (truncated) keywords as previously described , to infer the taxonomic and environmental affiliation of the strain. The most frequently occurring genera were Ruegeria (30.2%), Phaeobacter (29.4%), Roseobacter (13.9%), Silicibacter (13.7%) and Nautella (3.6%) (698 hits in total). Regarding the 30 hits to sequences from members of the species, the average identity within HSPs (high-scoring segment pairs) was 99.6%, whereas the average coverage by HSPs was 18.7%. Regarding the 20 hits to sequences from other members of the genus, the average identity within HSPs was 98.0%, whereas the average coverage by HSPs was 18.7%. Among all other species, the one yielding the highest score was P. inhibens (AY177712), which corresponded to a 16S rDNA gene identity of 99.5% and an HSP coverage of 18.6%. (Note that the Greengenes database uses the INSDC (= EMBL/NCBI/DDBJ) annotation, which is not an authoritative source for nomenclature or classification.) The highest-scoring environmental sequence was AJ296158 (Greengenes short name ‘Spain:Galicia isolate str. PP-154’), which showed an identity of 99.8% and an HSP coverage of 18.7%. The most frequently occurring keywords within the labels of all environmental samples which yielded hits were ‘microbi’ (2.8%), ‘marin’ (2.5%), ‘coral’ (2.4%), ‘sediment’ (2.0%) and ‘biofilm’ (1.9%) (509 hits in total). Environmental samples which yielded hits of a higher score than the highest scoring species were not found. Cells of BS 107T stain Gram-negative and are ovoid-shaped rods ranging 0.7–1.0 µm in width and 1.7–2.5 µm in length. Motility is achieved by means of a polar flagellum (not visible in Figure 2). Young colonies grown on Marine Broth (MB) at 23°C are 0.5 mm in diameter, circular, smooth, convex and brownish with regular edges . Colonies incubated for 7 days are 2 mm in diameter with irregular edges and produce a brown, diffusible pigment. Cells grow at temperatures between 15 and 37°C; optimal growth was observed in a range between 23 and 27°C. The optimal pH is 7.0, with growth occurring up to pH 10.0 but none below pH 4.0. Cells grow at salt concentrations ranging from 0.1 to 2.0 M NaCl, with 0.2 M being the optimal concentration. Additional thiamine (vitamin B2) is required for growth in minimal medium. Cells exhibit catalase and oxidase activity, but they do not exhibit amylase, gelatinase, ß-galactosidase, tweenase, DNase, urease, arginine dihydrolase, lysine decarboxylase and ornithine decarboxylase activities . Scanning electron micrograph of P. gallaeciensis CIP 105210T. BS107T is able to use the following substrates as sole carbon source and energy source: D-mannose, D-galactose, D-fructose, D-glucose, D-xylose, melibiose, trehalose, maltose, cellobiose, sucrose, meso-erythritol, D-mannitol, glycerol, D-sorbitol, meso-inositol, succinate, propionate, butyrate, γ-aminobutyrate, DL-hydroxybutyrate, 2-ketoglutarate, pyruvate, fumarate, glycine, L-a-alanine, p-alanine, L-glutamate, L-lysine, L-arginine, L-ornithine, L-proline, acetate and leucine. Bacteriochlorophyll a was not detected . The metabolic properties of Phaeobacter gallaeciensis CIP 105210T and the P. inhibens strains DSM 17395, DSM 24588 (= 2.10) and DSM 16374T (= T5T) were compared using the more sensitive Phenotype MicroArray (PM) technology . Here, using the statistical analysis (clustering and discretization) approaches as implemented in “opm” [18,19], the non-identity of strains CIP 105210T and DSM 17395 could be demonstrated despite an overall similar physiology. Differences could be found regarding the respiration of tyramine, which was positive in DSM 17395 and negative in CIP 105210T, and for butyrate, for which respiration was found to be negative in DSM 17395 and positive in CIP 105210T . A summary of the classification and features of CIP 105210T is presented in Table 1. Classification and general features of P. gallaeciensis BS107T according to the MIGS recommendations  published by the Genome Standards Consortium . Evidence codes - IDA: Inferred from Direct Assay; TAS: Traceable Author Statement (i.e., a direct report exists in the literature); NAS: Non-traceable Author Statement (i.e., not directly observed for the living, isolated sample, but based on a generally accepted property for the species, or anecdotal evidence). Evidence codes are from of the Gene Ontology project . The chemical composition of strain BS107T confirmed ubiquinones as the sole respiratory lipoquinones and revealed Q10 as predominant. Polar lipids consisted of an unidentified phospholipid, two uncharacterized lipids, aminolipids, phosphatidylenthanolamine, phosphatidylglycerole and phosphatidylcholine . The major fatty acids are the monounsaturated acids C18:1 ω7c (76.1%), and 11-methyl C18:1 ω7c (6.1%), followed by hydroxy fatty acid C16:0 2-OH (5.1%) as well as C16:0 (4.0%), C14:1 (3.1%), C18:0 (2.6%), C10:0 3-OH (2.2%) and C18:1 ω9c (0.9%) . A culture of CIP 105210T was grown aerobically in 100 ml of DSMZ medium 514  on a shaker at 28°C. Genomic DNA was isolated using the Qiagen Genomic DNA Kit, following the standard protocol for Bacteria 500G provided by the manufacturer. The extracted DNA had a concentration of 200 ng/µl. The quality of the DNA was checked with the NanoDrop. The genome of P. gallaeciensis CIP 105210T was sequenced using the Roche/454 GS FLX Titanium sequencing platform [Table 2]. A draft assembly based on 247,768 reads of a standard shotgun library and 204,863 reads of a 3 kbp paired-end library (LGC Genomics, Berlin, Germany) with a total of 138 Mb (22-fold coverage) was generated with Newbler assembler, Roche Diagnostics GmbH, Mannheim, Germany). This assembly consisted of 45 contigs 26 of which could be joined into 15 scaffolds. Gaps resulting from repetitive sequences were closed by PCR followed by Sanger sequencing, yielding a final genome size of 4,540,155 bp, that consists of one circular chromosome of 3,776,653 bp and seven circular plasmids. Genes were identified using Prodigal  as part of the Integrated Microbial Genomes Expert Review (IMG/ER) annotation pipeline . The predicted CDSs were translated and used to search the National Center for Biotechnology Information (NCBI) nonredundant database, UniProt, TIGR-Fam, Pfam, PRIAM, KEGG, COG, and InterPro databases. The Phaeobacter gallaeciensis CIP 105210T genome statistics are provided in Table 3 and Figures 3a, 3b, 3c, 3d, 3e, 3f, 3g, 3h. The genome consists of eight circular replicons with a total length of 4,540,155 bp and a G+C content of 59.44%. The replicons correspond to a single chromosome (3,776,653 bp) and seven extrachromosomal elements ranging in size between 255,493 bp and 40,170 bp. From a total of 4,448 predicted genes, 4,369 were protein coding genes and 79 RNA genes. The distribution of genes into COGs functional categories is presented in Table 4. 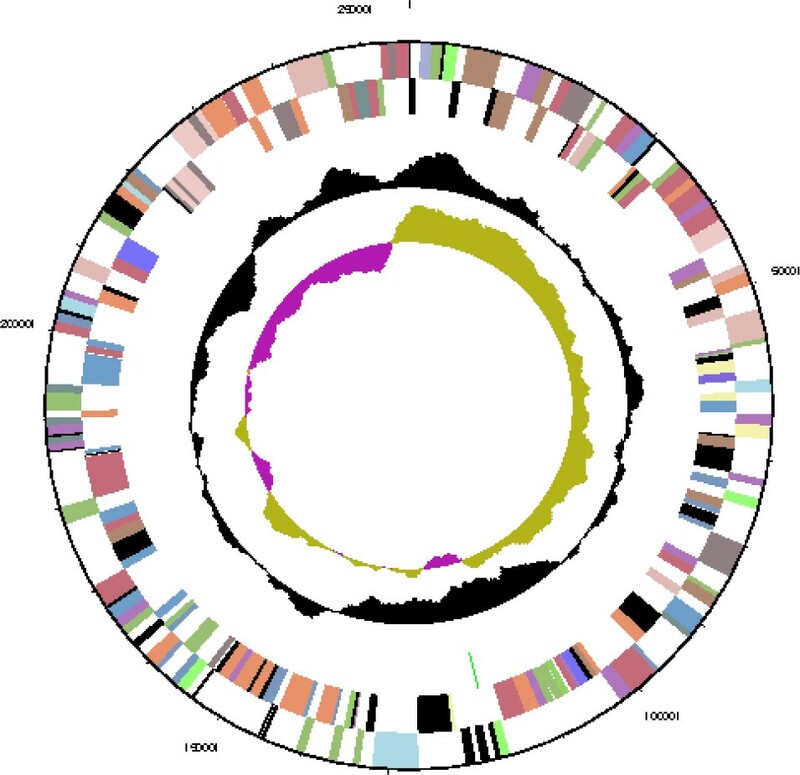 Circular graphical map of the chromosome. From margin to center: Genes on forward strand (colored by COG categories), genes on reverse strand (colored by COG categories), RNA genes (tRNAs green, rRNAs red, other RNAs black), GC content, GC skew. 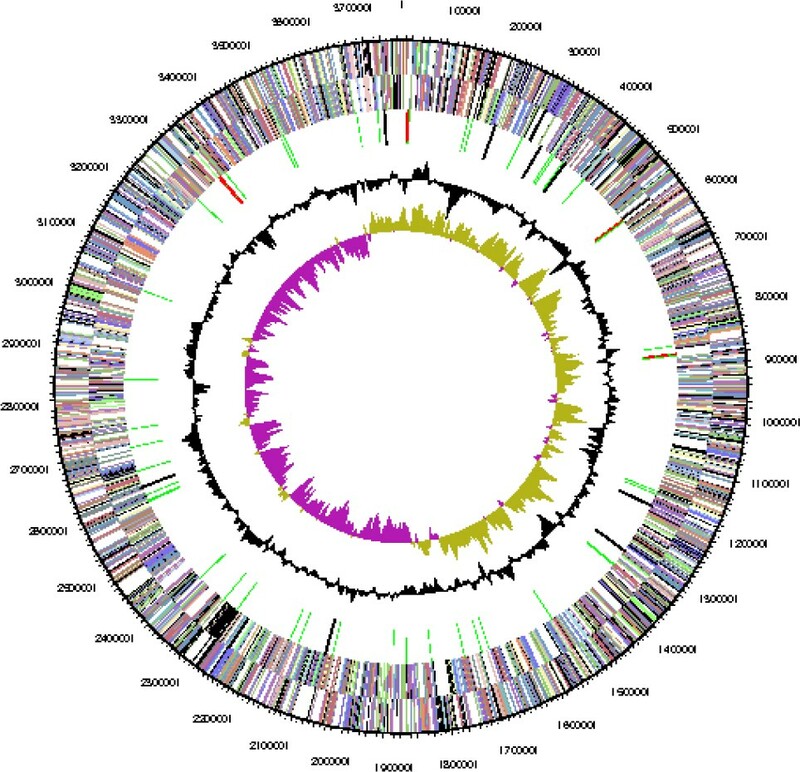 Circular graphical map of the extrachromosomal replicon pGal_A255. From margin to center: Genes on forward strand (colored by COG categories), genes on reverse strand (colored by COG categories), RNA genes (tRNAs green, rRNAs red, other RNAs black), GC content, GC skew. Circular graphical map of the extrachromosomal replicon pGal_B134. From margin to center: Genes on forward strand (colored by COG categories), genes on reverse strand (color by COG categories), RNA genes (tRNAs green, rRNAs red, other RNAs black), GC content, GC skew. A search for specific genes in the genome of P. gallaeciensis CIP 105210T compared to the P. inhibens strains DSM 24588 (= 2.10), DSM 16374T (= T5T) and DSM 17395, based on an e-value of 1e-5 and a minimum identity of 30%, resulted in a total number of 551 specific genes. 296 (54%) of these genes were located on the chromosome and 255 (46%) on extrachromosomal replicons. In comparison with the other completely sequenced bacterial strains of the genus Phaeobacter, 8% of the chromosomal and 35% of the extrachromosomal P. gallaeciensis CIP 105210T genes were unique, thus reflecting the considerable contribution of extrachromosomal elements to unique gene content. The observed distribution may be influenced by the presence of two chromosome-encoded bacterial MobC mobilization proteins (Gal_00154, Gal_01073). MobC, which is missing in all three completely sequenced P. inhibens strains, is part of the relaxosome at the origin of transfer and increases the frequency of plasmid mobilization and therefore conjugal transfer of plasmids , which is also in agreement with the comparably large number of seven extrachromosomal replicons present in CIP 105210T. The probable function of some of the unique genes is explained below. Genes Gal_01405 and Gal_01407 constitute methane monooxygenases (EC 1.14.13.25) facilitating the degradation of aromatic compounds and phenols . Gal_01397, a monoamine oxidase could provide an additional source of ammonium . Unique genes are also provided by phage-like elements. In CIP 105210T these so-called “morons” (because they add “more on” the genome ) comprise, e.g., an ABC-2 family drug transporter (Gal_01752) , and a negative regulator of beta-lactamase expression (Gal_02239). Six genomic islands could be identified on the chromosome with the web-based island-viewer system . Island-viewer combines the methods IslandPick , which uses a comparative genomics approach, SIGI-HMM , which relies upon deviating codon usage signatures, and IslandPath-DIMOB , which identifies genomic islands based on deviating GC content, dinucleotide bias in gene clusters and the presence of island specific genes like mobility genes and tRNAs. Island-I ranging from position 155,977 to 177,667 (21,690 bp) contains a tRNA gene (Phe GAA, Gal_00137) next to a site-specific recombinase XerD (Gal_00138) and the bacterial mobilization protein (MobC, Gal_00154; see above). Furthermore, it contains a transcriptional regulator of the LysR family (Gal_00160) and an adjacent ABC-type transport system for glycine/proline/betaine. Island-II (422,441 to 434,165; 11,725 bp) mainly consists of hypothetical proteins, but it also contains a large type II restriction enzyme (905aa, Gal_00442) and another site specific XerD recombinase (Gal_00444) next to a tRNA for proline (Gal_00445). Island-III (1,085,143 to 1,096,105; 10,962 bp) contains three XerD recombinases in row (Gal_01065 to Gal_01067, a MobC protein (Gal_01073) and the typical VirD2 relaxase (Gal_01074) as well as the VirD4 coupling protein (Gal_01075) of type IV secretion systems  indicating a plasmid-derived origin of this island. Island-IV (1,626,663 to 1,641,677; 15,014 bp) contains an ABC-type cobalt transport system and a XerC recombinase (Gal_01616). Island-V (2,821,359 to 2,848,860; 27,501 bp) consists mainly of regulated TRAP C4-dicarboxylate and ABC-type dipeptide/oligopeptide/nickel transport proteins and also the epsilon subunit of DNA polymerase III (Gal_02817). Island-VI (3,328,870 to 3,344,910; 16,040 bp) lies adjacent to a ribosomal rRNA-operon and contains an ABC-type amino acid/amide transport system and an E1 component of the pyruvate dehydrogenase complex (Gal_03286, E.C. : 1.2.4.1). The presence of phage-like elements was analyzed with the online tool PHAST . The program identified 16 genes representing a gene transfer agent (GTA ;) and three incomplete clusters of phage-derived genes with sizes between 15 kb and 40 kb (Table 5). aCompletedness, a prediction of whether the region contains an intact or incomplete prophage based on the applied criteria of PHAST; Score, the score of the region based on the applied criteria of PHAST; CDS, the number of coding sequences; Coordinates, the start and end positions of the region on the bacterial chromosome; GC%, the percentage of GC nucleotides of the region. Complete genome sequencing of Phaeobacter gallaeciensis CIP 105210T resulted in eight replicons ranging from 40 kb to 3.8 MB in size. For the seven extrachromosomal replicons, ranging in size between 40 kb and 255 kb (Table 6), circular confirmation has been experimentally validated. The extrachromosomal replicons were analyzed as described in  and . They contain characteristic replication modules  of the RepABC-, DnaA-like, RepA- and RepB-type comprising a replicase and a parAB partitioning operon . Plasmid pGal_E78 also contains a replicase that is homologous to those of RepABC-type plasmids, but the partitioning genes repAB are missing. The solitary replicase cannot be classified according to the established scheme  and is designated as RepC_soli-1a (RepC’ ). The respective replicases of the other extrachromosomal replicons that mediate the initiation of replication are designated according to the established classification scheme . The numbering of specific replicases corresponds to plasmid compatibility groups that are required for a stable coexistence of the replicons within the same cell . The comparison of the extrachromosomal replicons from P. gallaeciensis CIP 105210T and P. inhibens DSM 17395 documents a strong conservation and long-range synteny of three replicons. The largest 255 kb DnaA-like-I replicon (pGal_A255) is slightly smaller than the 262 kb equivalent (NC_018291.1), sharing 89% identity on nucleotide level. The RepB-I type replicon pGal_D78 exactly matches the size of the DSM 17395 replicon (NC_018287.1, 91% identity), whereas the RepA-I type replicon pGal_F69 is slightly larger than its equivalent (65 kb; NC_018288.1, 91% identity). On the contrary, RepABC-type replicons are not present in the DSM 17395 genome. However, only two of the four additional plasmids, the RepABC-5 type replicon pGal_B134 and the RepC_soli-1a-type replicon pGal_E78 possess type IV secretion systems that are required for conjugative transfer . Finally, the three replicons pGal_A255, pGal_B134, pGal_C110 are equipped with stabilizing toxin/antitoxin modules  (Table 7). 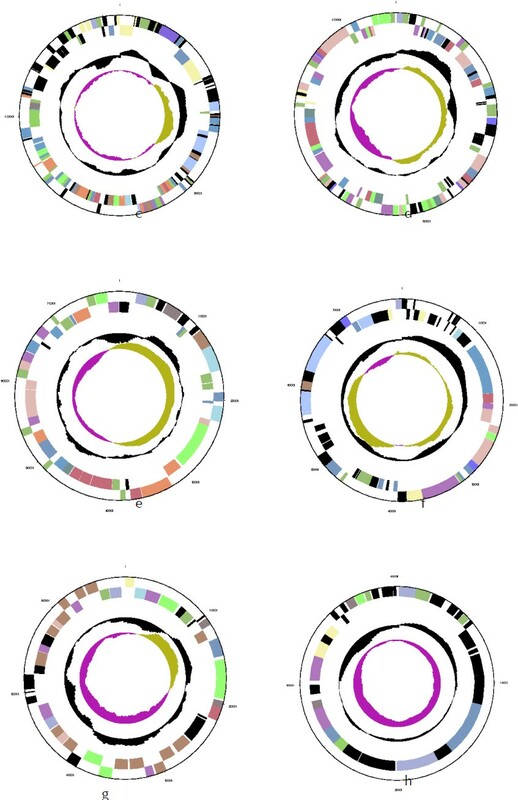 Integrated Microbial Genome (IMG) locus tags of P. gallaeciensis CIP 105210T genes for the initiation of replication, toxin/antitoxin modules and type IV secretion systems (T4SS) required for conjugation. The 255 kb DnaA-like-I replicon pGal_A255 is largely constituted by genes coding for proteins in COG E “amino-acid transport and metabolism” and COG P “inorganic ion metabolism” (Figure 4). The latter category comprises, for example, a Fe3+ siderophore complex (Gal_03846 to Gal_03848), which contains ferric-iron chelating agents that facilitate enhanced uptake of this essential compound . pGal_A255 furthermore harbors six genes involved in chemotaxis, a tRNA (Gal_03828) and a cluster for the biosynthesis of coenzyme PQQ, a redox factor (Gal_03896). The genes for the synthesis of the antibiotic tropodithietic acid (TDA)  are consolidated in a cluster on pGal_A255 and comprise tdaA (Gal_03819), tdaB (Gal_03818), tdaC (Gal_03817), tdaE (Gal_03815) and tdaF (Gal_03802). The 134 kb RepABC-5 type plasmid pGal_B134 harbors in comparison to the other seven replicons the most chaperons (COG O, Figure 4), owing to an elevated presence of cytochromes and disulfide bond formation proteins. pGal_B134 also holds a dimethyladenosinetransferase (Gal_03978) that facilitates RNA methylation and a T4S system (Table 7), thus combining on this plasmid genes for epigenetic modifications. The RepABC-8 type plasmid pGal_C110 consists mainly of amino acid and carbohydrate transporters (COGs E and G) and biogenesis of secondary metabolites (COG Q). COG K, transcription is also elevated, due to the presence of 15 transcriptional regulators. On the RepB-I replicon pGal_D78, COG K transcription is elevated, owing to the presence of twelve transcriptional regulators and a RNA-polymerase (Gal_04277). This replicon also contains genes for siderophore synthetases (Gal_04241 to Gal_04247) and a catalase/peroxidase (Gal_04279). On the RepC_soli-1a plasmid pGal_E78, proteins of COG C energy production and conversion are constituted by pyruvate dehydrogenase E1 and E2 components, which play a role in the citrate cycle and gluconeogenesis. The RepA-I replicon pGal_F69 contains an RTX toxin  (Gal_04412) and exhibits a strong accumulation of COG M, “cell-envelope biogenesis”. It harbors several polysaccharide export proteins including a type I secretion system ABC transporter (Gal_04381, Gal_04382), and a complete rhamnose operon . P. gallaeciensis CIP 105210T (= DSM 26440T) forms strong biofilms (unpublished results) and the extrachromosomal 69 kb replicon seems to be responsible for the attached lifestyle as previously proposed for the P. inhibens strains DSM 17395 and DSM 24588 (2.10) . pGal_G40 represents a hybrid between a plasmid and a circular phage, comparable to the coliphage N15 [60,61]. It contains an N-acyl-L-homoserine lactone synthetase (Gal_04460) and a complete repABC operon. This interesting finding draws a direct connection between RepABC directed replication , horizontal gene transfer and AHL-mediated quorum sensing . Summary and representation of the assortment of replicons in CIP 105210T as previously described in . Bars show the relative frequency of functional classes according to the database of clusters of orthologous groups of proteins (COGs). The cluster dendrogram arranges the replicons according to their overall codon usage. Codon-usage matrices were generated using yet unpublished scripts for the statistical analysis software R (version 2.15.0.) . The hierarchical clustering analysis was conducted using the pvclust function  with “complete” as agglomeration method. Pvclust also returns the AU (Approximately Unbiased) values as statistical support for clusters in percent. Support values >95% are given in bold. Asterisks indicate the presence of genes for conjugation (T4SS) as listed in Table 7. Genome sequencing of P. inhibens DSM 16374T (T5T) revealed the presence of the complete dissimilatory nitrate reduction pathway and anaerobic growth on nitrite has been validated experimentally . The genes of the pathway are located on three different replicons, i.e. the chromosome, the DnaA-like I type plasmid pInhi_A227 and the RepABC-8 type plasmid pInhi_B88. The genome of the sister species P. gallaeciensis CIP 105210T exhibits a conspicuous synteny for the chromosome and three extrachromosomal replicons (DnaA-like I (pGal_A255, pInhi_A227), RepB-I (pGal_D78, pInhi_C78), RepA-I (pGal_F69, pInhi_D69)). However, the RepABC-8 type plasmid including the crucial nitrous oxide reductase (EC 1.7.2.4) is missing in P. gallaeciensis CIP 105210T, and this strain is accordingly unable to grow anaerobically. 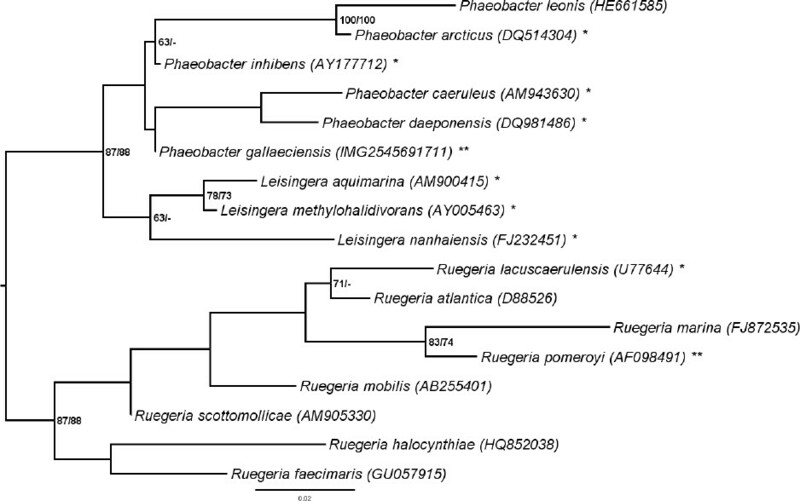 The phylogenetic analysis of 16S rRNA gene type-strain sequences places P. gallaeciensis together with both P. caeruleus and P. daeponensis, whereas P. inhibens forms a cluster with P. leonis and P. arcticus. Both clusters are set apart from each other, but the 16S rRNA gene tree is unresolved and does not allow one to infer the evolutionary interrelationships in this group. Previous results  showed that the reported P. gallaeciensis type-strain deposit DSM 17395 belongs to P. inhibens and that CIP 105210T (= DSM 26640T) is the authentic type strain of P. gallaeciensis. Moreover, the genome sequenced strain ANG1 has been referred to as P. gallaeciensis based on 16S rRNA analyses , but our recent study revealed a well-supported association with P. caeruleus and P. daeponensis . The relationships between these Phaeobacter strains have not been coroborated using genome sequences. Thus, we used the Genome-to-Genome Distance Calculator (GGDC)  to investigate the affiliation of strain ANG1 and the genomic similarities between P. inhibens and P. gallaeciensis strains from available genome sequences and conducted phylogenomic analyses to address the relationship between P. gallaeciensis and P. inhibens. Table 8 shows the results of the calculated digital DNA-DNA hybridization (DDH) similarities of P. gallaeciensis CIP 105210T and P. inhibens DSM 16374T (T5T) to other Phaeobacter strains. For DDH values ≤70% the respective query strain would be considered as belonging to a different species than the strain used as a reference [65,66]. 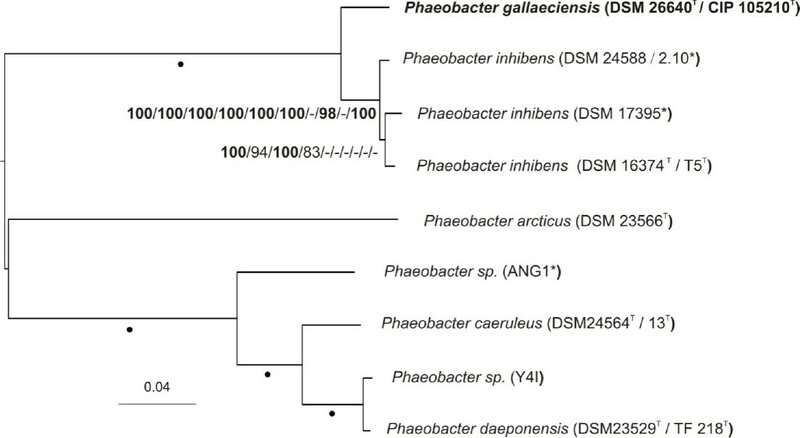 DDH similarities with standard deviations between P. gallaeciensis CIP 105210T, P. inhibens DSM 16374T (T5T) and other Phaeobacter strains calculated in silico with the GGDC server version 2.0 . The numbers in parentheses are IMG Taxon IDs identifying the genome sequence. With the exception of P. gallaeciensis ANG 1, which neither belongs to P. gallaeciensis nor P. inhibens based on DDH values, the analysis supports the current classification. P. inhibens with the type strain DSM 16374T (T5T) includes the strains DSM 17395 and DSM 24588 (2.10), whereas the strain P. gallaeciensis CIP 105210T (= DSM 26640T) is the sole representative of P. gallaeciensis analyzed in the current study. For the phylogenomic analysis, protein sequences from the available Phaeobacter genomes were retrieved from the IMG website (P. arcticus DSM 23566T; ID 2516653081; P. caeruleus DSM 24564T (13T), ID 2512047087; P. daeponensis DSM 23529T (TF-218T), ID 2516493020; P. inhibens DSM 16374T (T5T), ID 2516653078) or from NCBI (P. inhibens DSM 24588 (2.10), CP002972 – CP002975; P. sp. ANG1, AFCF00000000; P. gallaeciensis CIP 105210T (= DSM 26640T), AOQA00000000; P. inhibens DSM 17395, CP002976 – CP002979; P. sp. Y4I, ABXF00000000). These sequences were investigated using the DSMZ phylogenomics pipeline as previously described [67–70] using NCBI BLAST , TribeMCL , OrthoMCL , MUSCLE , RASCAL , GBLOCKS  and MARE  to generate gene- and ortholog-content matrices as well as concatenated alignments of distinct selections of genes. Maximum likelihood (ML)  and maximum-parsimony (MP) [78,79] trees were inferred from the data matrices with RAxML [80,81] and PAUP* , respectively, as previously described [68,70,72,83]. The results of the phylogenomic analyses are shown in Figure 5. The “full” and MARE-filtered supermatrix trees were topologically identical and the tree of the latter analysis is shown in Figure 5 together with ML and MP bootstrap support values from all analyses if larger than 60%. The tree inferred from the core-gene matrix showed a distinct grouping within Phaeobacter inhibens, i.e. P. inhibens DSM 17395 as sister of the clade comprising P. inhibens DSM 16374T (T5T) and P. inhibens DSM 24588 (2.10). The topologies of both MP and ML “full” and MARE-filtered supermatrix trees were identical, whereas the MP core-genes tree was topologically identical to the ML core-genes tree. Both gene-content and ortholog-content MP trees were topologically identical and showed P. inhibens DSM 16374T (T5T) as a sister taxon of P. inhibens DSM 24588 (2.10) and P. inhibens DSM 17395. Only the ML gene-content and ortholog-content trees deviated regarding the species boundaries, showing a clade comprising P. inhibens DSM 16374T (T5T) and P. gallaeciensis CIP 105210T (= DSM 26640T) as well as a clade comprising P. inhibens DSM 24588 (2.10) and P. inhibens DSM 17395. Phylogenetic tree inferred from the MARE-filtered supermatrix under the maximum likelihood (ML) criterion  and rooted using the midpoint rooting approach . The branches are scaled in terms of the expected number of substitutions per site. Numbers above the branches (from left to right) are bootstrap support values  (if greater than 60%) from ML/MP MARE-filtered supermatrix; ML/MP unfiltered (full) supermatrix; ML/MP core-genes supermatrix; ML/MP gene-content matrix; ML/MP ortholog-content matrix. Values larger than 95% are shown in bold; dots indicate branches with maximum support under all settings. Genomes marked with stars have been renamed according to this study and . Thus, the analyses supported the earlier conclusion  that DSM 17395 belongs to P. inhibens. The analyses also confirmed that P. “gallaeciensis” ANG1 belongs neither to P. gallaeciensis nor to P. inhibens and might therefore represent a novel, not yet named seventh species in the genus Phaeobacter. Further, the analysis confirms P. gallaeciensis CIP 105210T (= DSM 26640T) as the sole representative of the species Phaeobacter gallaeciensis. The authors gratefully acknowledge the assistance of Victoria Michael for growing P. gallaeciensis cultures and DNA extraction and quality control. The work conducted by members of the Roseobacter consortium was supported by the German Research Foundation (DFG) Transregio-SFB 51. BAuA. 2010, Classification of bacteria and archaea in risk groups. http://www.baua.de TRBA 168, p.